These strategies can help you thrive in your first year and build the kind of resilience that will carry you through the many challenges teachers face. This blog post is for you. Perhaps you’ve heard that your first year will be “sooo hard.” I want to offer you another possibility. Your first year might just be awesome. You might not only survive it but you could even thrive. Here are some suggestions to help you have a fantastic first year in the classroom. Your relationships with others will keep you strong, and they might be the key to fueling your energy to persist through challenges. Build strong relationships with your colleagues and administrators and with your students and their parents. If you’re shy, now is the time to pick up some strategies for making connections with others. Ask questions, knock on doors, and invite people into your classroom. Your community will be a buoy when times get hard. There are veteran teachers who are sad and cynical, and there are others who are wise and hopeful. If you find yourself amongst the cynical (I found them congregating in the staff lunchroom), leave. Stay far from that negativity. You need mentors who can share their wisdom and expertise and who can remind you at the end of October that things will get easier. If you can’t find any in your school, look in other schools in your district. They are there, and many will happily mentor you. Ask. Yes, I do suggest that you demand good professional development (PD). You have so much to learn as a new teacher (and I know you know that), and you can’t do it alone. Ideally, you need an instructional coach (coaching is a form of PD), but if you can’t get a coach, then at least you need some high quality PD. Ask other teachers to recommend workshops, online courses, and conferences. Your administrators don’t expect you to be perfect. They know you have a lot to learn -- so ask for support (persistently) to close those gaps. Ideally, observe really effective teachers in your school or other schools. Even if they don’t teach the same thing you do, you’ll learn a great deal. Pick one thing to pay attention to so that you don’t get overwhelmed. For example, pay attention to routines and procedures, the pacing of a lesson, how questions are asked, or the different ways that students are engaged. Ask your administrators for a release day so that you can do this. If they say no, then at the very least, take ten minutes a few times a month to poke your head into another teacher’s classroom during your prep period. You will learn so much from observing your colleagues. Visiting the homes of just a few of your students will provide unique insight and perspective into your students. You could visit just about any of your students’ homes and this would be the case. Visit the home of a student you are concerned about, as well as the home of a student you’re confident is doing well. This is easiest to do in the first few weeks of school when you’re building relationships with families, and you can explain that you want to learn more about your students. Use the visit as an opportunity to listen to parents -- to ask about their child’s interests, family, friends, and so on. Be curious. It’s not a time to share your concerns or complaints. What do you see as your goal or purpose as a teacher? Can you distill that into a short paragraph or a few sentences? Creating a personal vision or mission statement can help anchor you when times get hard. It can serve as a guidepost when challenges come up. You don’t need to make it too complicated or fancy. You don’t need to share it with anyone. This is for you. Sleep. Rest. Eat well. Exercise. You’ve heard it before. It really matters during your first year of teaching when the stress -- plus all the new germs -- depletes your immune system. Don’t wait until you get the flu in January to commit to taking care of yourself -- start now. Sleep. Once a week, at least, do something for yourself. Take a Saturday pottery class or a Brazilian dance class. Run marathons. Join a romance book club. Do something that engages other parts of your being. It’s easy and tempting to get sucked into all teaching, all the time during your first year, but you need a mental break from it. Write them down. Make lists of what’s going well. Identify your successes; include every single tiny one: Alfredo smiled today when he walked into class; James remembered his book; Jackie said goodbye to her mom and didn’t cry; I ate lunch; my lesson plan is done for tomorrow. If you don’t do any of the other tips on this list, but you do this one thing every day, I can almost guarantee that you’ll have a great year. Most teachers get personal days. Plan ahead, get a sub, and take them. Take them and catch up on laundry, go to the dentist, sleep, or go for a walk. Use them. You need days off. It’s okay. Your first year doesn’t have to be hard -- nor do subsequent years. 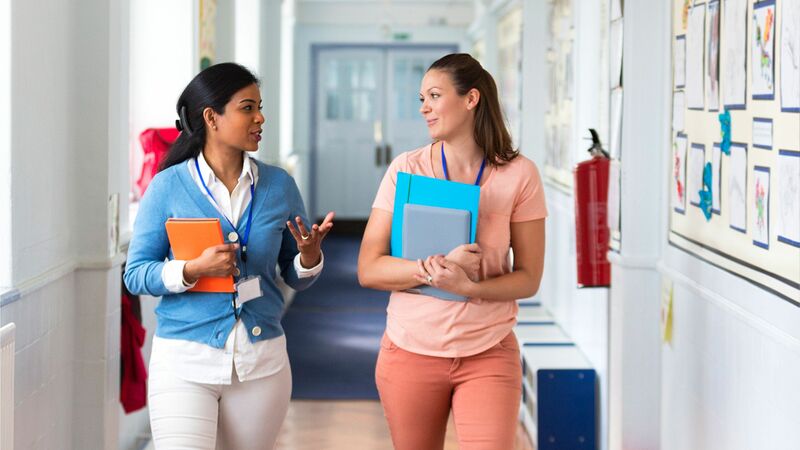 These strategies can help you thrive in your first year and build the kind of resilience that will carry you through the many challenges we face as teachers. By the way, welcome to the teaching profession. You’re embarking on a wonderful, wonderful journey.